zoe | Randomwhoness: a Doctor Who blog by Johnny Spandrell. Sampling stories in random order. 28 February 1969. A bitter night. Michael Troughton, 13, is waiting for his father to come home from work. He’s been rehearsing today, part of the all-too-familiar treadmill of working on Doctor Who: rehearse all week, unless you’re called away for pre-filming, then record on a Friday night, in a tense and often fraught race against the clock. Then, forget all that and do it again next week. Rinse and repeat for 42 weeks of the year. Over dinner, it transpires that Patrick is far from happy with his lot on Doctor Who. He’s fighting with the producer. And the director. The problem at hand is the current story, in which Troughton’s Doctor and his companions are stuck in a one-room spaceship for two episodes. So irritating are these problems that Troughton seems to have lost his love for the show. And the production which has driven the show’s usually affable star to despair? Welcome to The Space Pirates. The story which broke a Doctor. Troughton, like Hartnell before him, and Tom Baker after him, became “difficult to work with” TM after a few years of being Doctor Who. Troughton described it to a friend as the role making him feel schizophrenic, although he could also be forgiven for simply being exhausted. In the series fifth production block (from The Abominable Snowmen to The Mind Robber), they made an incredible 46 episodes, at a rough rate of one a week. That pace seems not just punishing, but also mentally disorienting. Who would know which base was under siege by which monster from week to week? Troughton famously complained about the workload and scored a few concessions such as shorter episodes and better scheduling of pre-filming. The Space Pirates feels like it was written in response to that, and the Doctor and his companions’ involvement in a plot about mineral stealing bandits being chased by po-faced space policemen and a moustache-faced space cowboy, is correspondingly minimal. If it was a deliberate strategy to give Troughton a break, it doesn’t seem to have placated him. His son remembers him complaining about the story being boring. And although he was right on that count, it does begin to sound like Troughton was so exhausted he didn’t know what he wanted. He asked for and got a reduced workload, but this resulted in less involvement in the story and thus less screen time; few leading actors would ever be happy with that. This strikes me as reflective of Troughton’s contradictory relationship with stardom, which seems to have both attracted and repelled him. From all accounts, he was a deeply private man, who had taken on one of the highest profile jobs in television. He created a character beloved by a generation of children but avoided doing public appearances. He seems to have been a man who wanted to have his cake and eat it quietly, out of sight of anyone. Then on top of all this, there’s an actor’s understandable concern about stability. Michael Troughton’s book paints a picture of a man who worried about typecasting and about not being able to find work because of it. This was not unwarranted fretting; after all, the man had not one but two families to feed. It seems he wanted the stability of income which being Doctor Who brought but also wanted the creative freedom to do new things. With all this on his mind, no wonder he was a bit tetchy as the end of his Doctordom loomed. The rest he longed for was within reach but so was the precariousness of freelancing. Even though it represents the fag end of his era, The Space Pirates pushes Troughton’s Doctor into some new places. There is, for example, an emphasis on his Sherlockian deduction, like noticing a wound up clock in a supposedly long abandoned room or that an intact but fragile bowl at the bottom of a pit indicates a secret entrance. He also seems to have gained Felix the Cat’s ability to pull exactly the right piece of random ephemera out of his bag of tricks as needed to get out of trouble: marbles, magnets, drawing pins and tuning forks. As written by Robert Holmes (whose second Doctor Who story offers no hint of the greatness to come), his Doctor has suddenly turned into a man with a quirky fix for all occasions. Holmes is also using The Space Pirates to dry run a few of his favourite set pieces. The Doctor and his companions being locked in an airless room, for instance, ala The Two Doctors and The Ark in Space. And also reused in that later story, the risk of the Doctor being trapped in the exhaust of a departing spaceship. But in other ways, it feels distinctly unlike the cinema horror pastiches Holmes would regularly offer the series in future. Never again would he give us goodies and baddies chasing each other in space. And never again would he dabble with familial drama as he does here, with Madeleine Issigri (Lisa Daniely) re-discovering her long lost father Dom (Esmond Knight), who’d been locked in Edwardian study for years. Holmes doesn’t seem comfortable with this element at all; he leaves their eventual reunion offscreen. Madeleine, who turns out to be in league with the pirates, at least until they start to get all murdery, is Holmes’ only concession to complexity of character. Again, it’s not what we’ll grow to expect from him, but the other characters are one-note, like bad guy Caven (Dudley Foster), and space cop Hermack (Jack May, he of the fruitiest voice ever). The only variation is the first of Holmes’ mavericks, prospector Milo Clancey (Gordon Gostelow), and he is so overplayed that any potential pathos Holmes gives him when he discovers his old friend Dom is alive is lost underneath an absurd cowboy accent. 28 March 1969, Lime Grove Studio D. The recording of the last episode of The Space Pirates. Troughton’s scenes have all been pre-filmed so he doesn’t have to turn up. Presumably, no-one missed him. That it had come to this: a show which doesn’t need its star and a star who doesn’t want to make his show. Whatever strengths and weaknesses The Space Pirates has, they’ll always pale in comparison to the languorous impression it leaves, that of a show in desperate need of change. PLEASE CHECK OUT: Patrick Troughton: The Biography by Michael Troughton, much referenced in this post. LINK TO Demons of the Punjab: Long lost family secrets in both. NEXT TIME: It’s down there. In the pipes. Waiting! Time to unleash the Fury from the Deep. Welcome to The War Games, Doctor Who’s longest story. No, you say, what about The Trial of a Time Lord? Four separate narratives, I say. All right, you say, but what about The Daleks’ Master Plan? You can’t deny that one! Well, I can in fact. As you’ll see if we ever get around to randoming it, I’d say Master Plan’s episodic format makes it feel like a series of mini-stories rather than one big one. That leaves The War Games with the series’ longest contained narrative. And unlike those other contenders, it feels like one epic story, told over a record-breaking 9 episodes. I say 9 episodes because that’s how long it takes to wrap up the main story. Episode Ten, is an epilogue and although it contains some bonus sneering and running around with the War Lord (Philip Madoc), it’s dealing with something else entirely. It’s a one episode story about the Doctor’s final come uppance with the Time Lords. And of course, it changes the show forever. The War Games has been mightily re-evaluated in recent years. It started with a glowing review of the DVD by Gary Gillatt in DWM. Even co-writer Terrance Dicks, who had for years proffered a line that the story began and ended well but flagged in the middle, was convinced. So its reputation has grown to the point where it’s now our favourite 60s story, according to DWM’s 50th anniversary poll. For me, it’s too patchy to be consistently satisfying. Those early episodes set in faux World War One are terrific though. The design work is excellent, the characters are believable and well portrayed and director David Maloney brings out a pervading sense of menace. Then there’s the unsettling sight of our cozy TARDIS team of silly old Doctor (the Trought, on form), funny old Jamie (the Fraze) and fussy old Zoe (the, um, Pads) suddenly dropped into shocking danger, the threat of violent death all around them. All capped off with that brilliant cliffhanger to Episode Two, when time zones collide and Roman soldiers come charging out of nowhere at our friends. But after those initial episodes, the action is shared between the earthly war zones and the bad guys’ HQ. Their base has some fetching op art on the walls but is otherwise so much plywood and vac formed plastic. Clearly, the budget has run out. Billowing plastic sheets replace walls. Characters hide from others behind the scantest of flats, and their pursuers must pretend not to see them. Walls are too expensive, black drapes must suffice. Spaceships are controlled by play magnets. It’s resourceful work when faced with limited dough, but it can’t help but look tacky. Dicks and co-writer Malcolm Hulke have over four hours to fill with material, but never get around to giving these “aliens” a name or a planet of origin. We have to assume then that it’s a deliberate move to keep them non-descript. Because they don’t have individual names either. They are either named after their occupations (War Lord, Security Chief and Scientist) or after the fictional characters they take on when in the time zones (General Smythe, Von Weich). In fact, the only thing which distinguishes them is their predisposition for eyewear, either the sinister pebble glasses type or the wacky sunvisor type. So we switch regularly from the relatively realistic settings of historical wars to this b-grade world of flimsy sets, generically named people and unlikely spectacles. But it’s in the latter that we find the Doctor’s greatest secret hiding. Because the War Chief is not actually one of this colourless race. (You can tell by the way he’s wearing a hood ornament on a big chain around his neck). In fact, he’s a Time Lord, one of the Doctor’s kith. “You may have changed your appearance, but I know who you are,” he purrs, when the two finally get some time alone in Episode Eight. And so Dicks and Hulke set about dismantling the framework the show has been built on over the last six years. We know in hindsight that The War Games was designed to kick the show into a new format. But it feels like it could also have been the end of the show, if that’s what was required. It doesn’t feel definitive. It’s having a bet each way. That last shot of a decapitated Doctor spinning helplessly through to oblivion – quite disturbing, really – is basically saying, we don’t know if there’s a future for this show. Patrick Troughton picks up on this uncertainty. He plays his Doctor not with the restless energy of an eternal runaway, but with the resignation of a fugitive who knows the game is up. It’s his companions who have to spur him on to try to evade his Time Lord judges. Throughout these ten episodes, Troughton never stops looking for the lighter moment amongst all the gloom. He never stops trying to energise a flagging moment. But still, he’s a Time Lord at the end of his time. Episode Ten – that little recognised one parter – gives him some excellent material to work with though. In a scene destined for clip show after clip show, he rails against the inactivity of his fellow Time Lords. While some old monster costumes are wheeled out to wobble in front of black curtains, the Doctor stakes his claim. There are some corners of the universe that have bred the most terrible things. They must be fought, not merely observed. There’s still a need for him to be a funny, brave, compassionate hero. It might be doubtful about the future, but this story is very clearly saying, there’s still a need for Doctor Who. LINK to The Girl Who Died: Aliens disguised as earthly warriors. NEXT TIME… The fat just walks away. We take on some Partners in Crime. So here’s the thing: it’s not called The Land of Fiction. Or even The Fact of Fiction. It’s called The Mind Robber. And I suppose that could be an attempt to disguise the nature of the fantasy world that our friends the Trought, the Fraze and Padders find themselves in during this surreal adventure. Not trying to give away the game too soon. But I think it’s more than simple misdirection. This story is ostensibly about a land of fiction, but is more concerned with attacks on the mind. Perceptions are altered. Characters from fantasy are brought to life. Our heroes experience nightmare situations from twisted memories of childhood. It’s not just a trip into a land of story books; it’s simply a trip. It’s a mind altering experience. It’s Doctor Who‘s only real brush with psychedelia. The show may have still been seen by many in 1968 as a children’s programme, but the makers of Doctor Who were clearly considering how drug taking was leading to new physical and mental experiences. The show’s first change of Doctor was described in terms of the effects of the ‘LSD drug’. Now two years later, we have a five week break from ordinary Doctor Who, which starts with being taken out of reality, and ends so abruptly that the whole thing might have been a dream. If our TARDIS team had started this adventure by all taking little white pills, I wouldn’t have been surprised. It doesn’t start like that, of course. It starts with an episode of filler, required when the production team decided they couldn’t face a sixth episode of The Dominators. This opener, written by script editor Derrick Sherwin, although he wasn’t proud enough of it to take a credit, is an unusual the-dog-ate-my-homework sort of effort. With the scantest of resources available to him – the TARDIS set, a blank white studio and an empty black soundstage – Sherwin fills the episode with time-killing incident, none of which he feels obliged to explain. What is the ‘nowhere’ in which the TARDIS lands? How does it relate to the Land of Fiction? Why does the TARDIS disintegrate? Why does an unseen force want to lure our friends outside? And what exactly happens when the console spins away through space, Jamie and Zoe hanging on for dear life, arses in the air, leaving the Doctor rotating on the spot? There are no answers. Sherwin seems to take his cue from the rest of the story, which being set in a fantasy land, gives him carte blanche to do what he likes and keep the explanations few. It’s a kind of narrative free pass – do whatever you like! It’s The Mind Robber, the normal rules don’t apply. It’s the same approach which allows Sherwin and fellow writer Peter Ling to change Jamie’s face when Hines contracts the chicken pox. Both are story saving expediencies born of this story’s dabbling with surrealism. So in lieu of narrative logic, the writers give us arresting imagery. Don’t worry about what makes sense, worry about what looks cool. The TARDIS exploding and the console spinning through space are two memorable examples, but there’s also Jamie’s rejigged face (Hamish Wilson), Zoe stuck in a glass jar, a forest of letters, a charging unicorn (on another empty black set), the stop motion animation of Medusa’s snaky head, our friends being crushed in a giant book and so on. This story serves up a continuous stream of surreal images. There’s even a word puzzle in the middle of it, which requires superimposed letters onscreen to make it clear what’s going on. It’s telling that this story has never been released on audio; it’s a story which demands to be seen. Lord knows what we’d have made of it if it hadn’t survived the junkings. This smorgasbord of surreal imagery helps add to the trippy feel of the thing. It’s not so hard to imagine having a hallucinogenic experience akin to The Mind Robber, where crazy, random images picked out of memories of childhood stories parade past you. But that’s the style of the story, not the story itself. Within the narrative, none of our heroes ever question the reality of what’s going on around them. No one ever asks, “are we dreaming?” None of them question the reality of this world any more than they questioned whether Dulkis or the Space Wheel were real. So while everything around them suggests this is a bizarre fantasy, the Doctor, Jamie and Zoe never treat this as anything other than a standard Doctor Who story. They cling to their real existence… Which itself is confusing because they are also fictional. When the Doctor starts drawing a line between himself, Jamie and Zoe as being real and Gulliver, Medusa et al as being fictional… Well, it’s so meta it makes my head spin. The Mind Robber? More like The Mind F*cker. In the end, the thing which has actually stolen a mind is another computer with ideas above its station (see also The Keys of Marinus and The War Machines). It has enslaved a writer from Earth in the 1920s, who has filled this world with copyright-free fictional characters. Why the computer wants to create such a world remains unexplained but don’t worry, it looks cool, right? 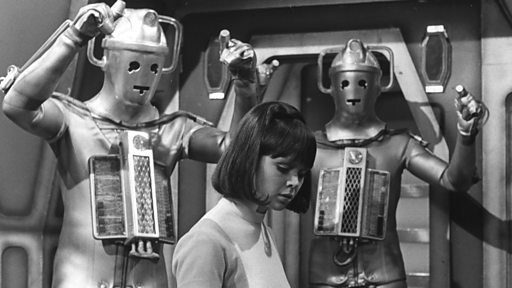 As we race to the story’s end, we learn that the computer has plans to invade the Earth, and one of the Troughton era’s familiar themes reasserts itself: the importance of self and of retaining identity. When he hears the full plan, the Doctor’s appalled that humanity will become just like a string of featureless sausages, all the same. And in encouraging Jamie and Zoe to resist the mind control they’ve submitted to, he urges them to “think for yourselves!”. This then, is the threat of opening your mind up to perception enhancing experiences, as The Mind Robber sees it – that you lower your own mental defences and sinister controlling influences might sneak in. It’s not quite a repudiation of psychedelia, because this story is not quite dealing with it in the first place. But it’s comforting that while Doctor Who flirts with psychedelia, it’s also sending a message to the kids; this might look like fun, but no good is going to come of it, right? It ends in classic style, with Jamie and Zoe ‘overloading’ the computer by pressing all the buttons all at once (that’s usually how it’s done) and the Doctor rescuing the enslaved writer. They all run onto yet another empty black set and wait for the story to end, as if they’re waiting for a bus to arrive. Somehow it all gets magically put to right. They’re transported back to reality. The TARDIS reassembles. How? Who knows. But it looks cool, right? LINK TO: Silence in the Library/Forest of the Dead. Well, maybe I’ve been taking the mind altering drugs, but is it too trippy to suggest that the Land of Fiction might be the kids’ lit section of the Library? NEXT TIME: Dad Shock. We get a lot of it around our place. It’s time to meet The Doctor’s Daughter. I wonder when it was during the production of Season Five, that someone on the production team counted how many ‘base under siege’ stories they done. Blimey, there are a lot of the buggers. It’s no wonder that by Season Six, they wanted to try something different. It’s a wild old thing Season Six. One minute they’re heaping scorn on a world of pacifists, the next they’re taking an excursion into a story book, the next it’s James Bond with Cybermen. The series really did take a sudden left turn away from isolated scientific outposts, truculent commanders and lashings and lashings of foam. Certainly, I think writer Robert Holmes noticed, because in his debut story for Doctor Who he inverts the standard Season Five structure, by placing the alien Krotons crystalline base (ladies and gentlemen, a big round of applause for Miss Dinah Trope!) inside the humanoid Gonds’ city, and have people constantly trying to break in to get at them. It’s the Krotons’ base which is under siege. Nice work, Mr Holmes. You’ll go far. Holmes tells the story of how the Dynatrope sits like a permanent tumour in the heart of the Gonds’ city. The Gonds are educated by teaching machines provided by the Krotons, and every so often, the two smartest swots are given fancy cloaks and sent inside the Dynatrope, never to return. This is the state of affairs that the Gonds have put up with for thousands of years and the reason why they’ve never rebelled is that the Krotons have edited out all the information which might have helped them put two and two together. “It’s a kind of self-perpetuating slavery,” muses the Doctor (the Trought, in playful form). He’s right, but it’s also a throw back to one of this era’s other themes, of whole races of people kept subordinate by being deliberately kept in ignorance. Think of the hapless colonists of The Macra Terror, or more recently the subterranean dupes of The Enemy of the World. I’ve written before about how this era of the show is often about threats to personal identity, but this theme is about the ability to enslave through manipulation rather than the threat of physical violence. But as is so often the case, the arrival of the Doctor is a catalyst. Hotheaded Thara (Gilbert Wynne) leads an attempt to vandalise the teaching machines. In 1968, students rioted against authority on the streets of Paris, so we can see the mirroring of real life events. But it’s not an analogy Holmes keeps up for long. 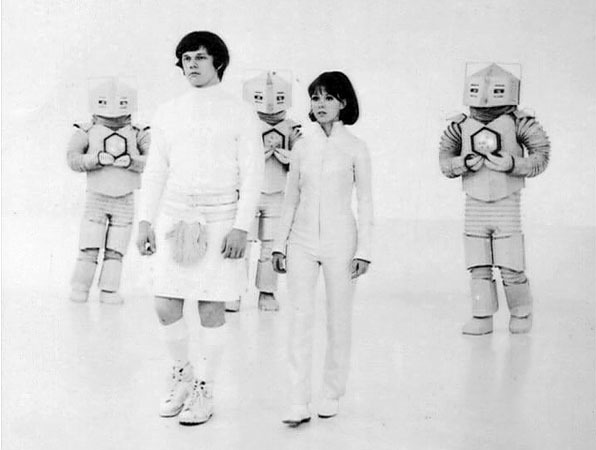 In plot terms, the machines are needed to facilitate the Doctor and Zoe’s (Wendy Padbury) entry into the Dynatrope. They answer a few sums on the machines and are declared ‘high brains’ so are given access. In fact, our heroes’ brains are so high that they cause the reanimation of the Krotons themselves, creatures who get less impressive the further you get away from their heads (which are solid angular creations on broad metallic shoulders, which unfortunately give way to plastic tubing arms, which unfortunately give way to a smooth shiny skirt). They emerge out of bubbling tanks, like some Hammer horror off a mad scientist’s bench top. Holmes penchant for the gothic gets an early workout here (Holmes will pull off a similar tanky reanimation a few stories later in Spearhead from Space). When they speak, it’s with booming South African accents, which, as The Sontaran Experiment will tell you, is the go-to accent for strange and alien. We never get monsters which speak with French accents, mores the pity. Or Swedish. Or Dutch. The campaign starts here. But despite these glimmers of interest within The Krotons, the rest of it is a shabby affair. Not just because the sets and props look terribly creaky (perhaps they spent all this story’s budget on The Invasion) but the script is nowhere near as witty and well rounded as we’ll learn to expect from Holmes. The supporting cast are all fairly unimpressive, but it’s not like they’re helped along by any memorable dialogue or consistent characterisation. A howling example comes at the end when head Gond Selris (James Copeland) sacrifices himself to get a bottle of acid to Zoe and the Doctor. His death goes uncommented by everyone, including his own son, that firebrand Thara. You really are a forgettable character if your own son can’t be arsed to mourn your death. 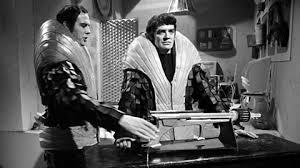 It’s easy to write The Krotons off as tacky, uninspiring addition to Troughton’s era. But in some ways it’s a story which has continually punched above its weight. It really shouldn’t exist at all; it was commissioned as a fall back option in case any other stories had to be shelved. Which is exactly what happened – imagine how awful The Prison in Space must have been if they thought making The Krotons was a better option. But it’s wasn’t to be so easily forgotten (try as we might). It gained prominence by its inclusion in the Five Faces of Doctor Who repeat season in 1981, by virtue of being the only surviving four part Troughton story at that time. For many fans, this makes The Krotons their first taste of Troughton’s era, and so I think it’s gained a special place in people’s memories, if not affections. (It kind of happened in Australia too, when in 1986, we suddenly got repeat screenings of this story and The Mind Robber). And that’s not so bad, because although the story’s pretty ordinary, Troughton, Zoe and fellow traveller Jamie (Frazer Hines) are on good form trying to liven things up, so at least an impression of their joint chemistry had been formed by The Krotons’ encore viewing. Even more recently, we haven’t quite been able to give up on this story. Lawrence Miles’ terrific Eighth Doctor novel Alien Bodies, turned the doddery Krotons into Dalek killing predators. And Big Finish Productions, those champions of long forgotten B-listers of Whos past, conjured up a Return of the Krotons for the Sixth Doctor. We can’t quite seem to let these also-rans go. It’s in part because we’ve grown to admire the work of Holmes so much through his subsequent, more interesting Doctor Who stories. We want to go back to this, his earliest, formative work and re-examine it, to find in it some speck of genius which has been hidden from us for so long. Surely Holmes, that master of Who, hid something up his sleeve which we can find in retrospect. Sadly, though, I don’t think he did. Mad old Season Six. What did it have in store for us next? Why, The Seeds of Death, with lumbering monsters, an isolated scientific outpost, a truculent commander and lashings and lashings of foam. Ah well, maybe after the terror of The Krotons, there’s still some comfort to be found in a base under siege. THING I COULDN’T FIT ANYWHERE ELSE: All the episodes start with a shot of a circle, or some vaguely round shape. What’s that about then? LINK TO Castrovalva: actually it’s about the same as for The Enemy of the World – a small community kept in ignorance of the true shocking nature of their world. NEXT TIME: Burn with me! We’ve got 42 minutes till we fall into the sun. Hello from the future! Oh look at you back in 2015. Did you enjoy Peter Capaldi’s first season? Wait until he’s rejoined by Amy and Jamie and the TARDIS implodes from the utter Scottishness of it all. And when he gets to the planet Delphon where they communicate with their eyebrows. He does himself a serious injury and is forced to regenerate… Oops, sorry. Spoilers. But, inhabitants of the past, I have brilliant news. The omnirumour turned out to be true! Every missing episode returned! And you lot thought you were well off when The Enemy of the World and The Web of Fear came home from their extended Nigerian holiday. Well here in the future, we have ’em all. Except Time-Flight. We lost that one deliberately. So what do you want to hear about first? The delights of Marco Polo? The thrills of The Power of the Daleks? Of course not, you’re desperate to hear all about The Wheel in Space aren’t you? Well, I’m not sure you’re going to be overjoyed with Episode 1, let’s get that out of the way first. For the most part it’s a two hander between Patrick Troughton and Frazer Hines. And while that sounds brilliant on paper, this is also a kind of one episode filler before the main action starts. So the Doctor and Jamie land on an abandoned rocket. They’re forced out of the TARDIS. So they have a look round. There’s a silent plodding robot. Then Jamie settles down for a nap. Honestly, when one of your two characters decides to sleep in the middle of an episode, you’re on shaky ground. And this is filler written by former script editor David Whitaker, so this gives him scope for taking up time with some of his pet subjects. The TARDIS trying to communicate with its crew via pictures on the scanner. Lots of faffing around with a food machine. Mercury. All his greatest hits. Hmm, maybe Jamie’s onto something with that snooze. Late in the episode (just enough to get paid) the crew of the Space Station W3 turn up and prepare to blast the mysterious rocket out of the sky. The Space Wheel is familiar territory to anyone who’s paid at least passing attention to Season 5. There’s a mixed group of personnel in spacy costumes led by an autocratic male commander. But specifically, this is a multinational crew, so what this really feels like is The Moonbase, which in turn really felt like The Tenth Planet. So innovative, this series. In Episode 1, the Doctor hit his head and so he spends Episode 2 unconscious, while Troughton takes a holiday. Focus shifts to the Wheel and Jamie has to carry the episode, which also introduces us to new brainiac companion Zoe Herriot (perky Wendy Padbury). Now, this will be familiar to you folk back in 2015, because The Web of Fear had its Doctorless episode 2 returned as well. The good news is that Wheel in Space covers his absence better, with all the introductory stuff about the Wheel – stuff you’d ordinarily expect to find in Episode 1 – being played out. Still it’s always a like a bit less of a party when the Doctor doesn’t show up. So this is another episode which might disappoint when you finally get to se it. Episode 3, of course, you know and love. 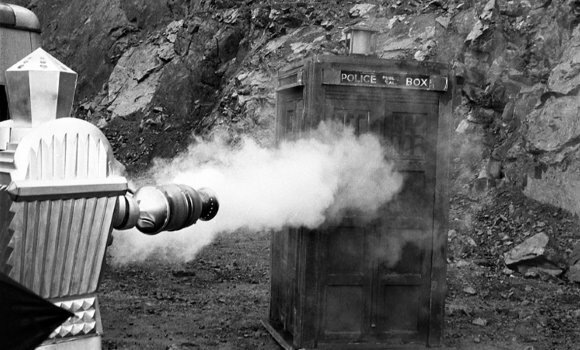 But watched in isolation, you may not realise that this is the episode when the Cybermen finally turn up. That’s one third of a monster story without its monster. That’s some delayed gratification. It’s also unusual because the Doctor spends the whole episode in bed. Luckily people keep bringing him plot points to discuss, so he doesn’t have to move much. He doesn’t actually get out of bed until half way through Episode 4, so he’s well and truly rested. He tries to convince this week’s grizzled base commander that the Cybermen are on the Wheel and are a menace. But Jarvis Bennett (Michael Turner) is having nothing of it. ‘He’s a strange man to be in a position like this’, says the Doctor and he’s spot on, and not just because his accent wavers from South African to American and back again. Jarvis dislikes his 2IC Gemma Corwyn’s (Ann Ridler) habit of playing armchair psychologist (in fact the script takes a few jabs at psychology in general, which a number of characters treat with disdain), but the irony is he’s gradually going crackers, and maybe a psych assessment would help. Plus his lines are all delivered with a kind of halting mania, so that when it’s his turn to take a nap mid episode (Seriously! Stay awake through the whole story please!) it’s a blessed relief for the other characters and the audience. But the most, um, astonishing performance is Episode 4 is that of Peter Laird, who plays Chang. I don’t know anything of Mr Laird’s background, but I’m willing to bet he isn’t/wasn’t Chinese. This, in the worst yellow face tradition, doesn’t stop him putting on an oriental accent. His delivery of the line ‘I’m on my way’ is particularly cringeworthy. If the performances in The Talons of Weng-Chiang make you feel a little queasy, this one’s even worse. In Episode 5, something approaching tension builds when the Cybermen attack the Wheel and kill Gemma. You feel genuinely sad when this happens. She’s the only character in the whole thing who seems to have her head screwed on right, and one of the few who’s not putting on an outrageous accent. Although she’s very quick to suggest electric shock therapy for Jarvis. You can’t trust those psychologists. Still, it might just be time to attach those electrodes, as Jarvis finally checks out, once Zoe stuffs a dead Cybermat under his nose. ‘Not true, not true!’ he mumbles, despite the tinny, googly eyed evidence in front of him. 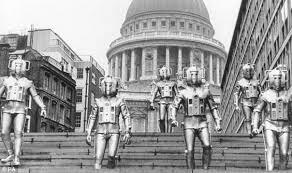 And because the story only has two Cybermen at its disposal, much fuss is made about their ability to control humans and thus these walking zombies become surrogate monsters. There’s some fun to be had when two of the Cyber contolled humans (Laleham and Vallance, who sound like a snobby manchester store) take on gruff Irish crewmember Flanagan (James Mellor). Turns out the Irishman is itching for a stoush. ‘If it’s a fight you’re after, I’m your man!’ he roars. ‘You need a few lessons in the noble and manly arts, me bucko!’ No wonder that when Flanagan himself is zombified and turns into a quietly spoken rather passive fellow, the Doctor immediately spots something’s up. And by then we’re on to Episode 6, which again you know all about and which finally brings the Doctor face to face with the Cybermen. There’s a scene where the Doctor lures them into a room and electrocutes them (Is this the ECT machine Gemma was keen to break out? Were those Cybermen depressed?) and while Troughton enlivens it where he can, it’s all very contrived and stagey. Which is true of the whole story really, a longer, flabbier retelling of other Cybertales. I hope I haven’t disappointed you too much, history dwellers. But not every returned story can do an Enemy and turn out better than its reputation. But until the whole story is returned to the archives it might comfort you to think that you already have the story’s two best episodes on hand. LINK to The Ribos Operation. Both introduce clever new companions. NEXT TIME… I can’t see the point of Paris. So let’s home share with The Lodger for a while.